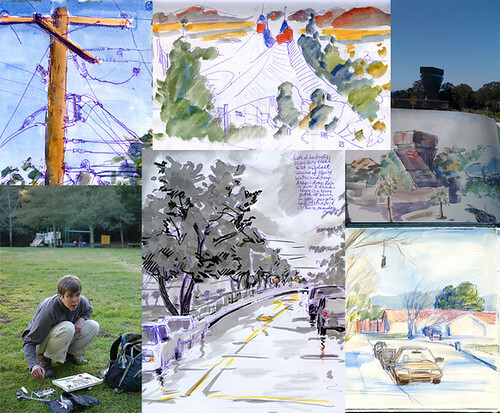 I enjoy the process of discovering a face of an urban landscape - through drawing and painting and just quiet moments. And I sketch nature and how it survives in cities around the world and first of all right here - in the Bay Area. My main tools are ink and watercolors, sometimes watercolor pencils. Oils and Acrylics are great for studio but too cumbersome for on the go - as a freelance illustrator and graphic designer AND a young mom I need to be ready to drop everything and run (literally)! I work in my sketchbook daily. 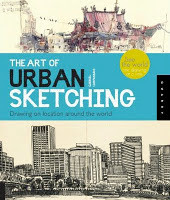 Small drawings or 10 pages - does not matter - I enjoy the continuity and flexibility, the rhythm. Sketchbook became an art form in itself for me. I am honored to be a part of this blog and look forward to sharing my work here. I think it's almost one year that I am following your Ink- watercolor in Flickr . Your are great on both areas and I always enjoy them . Welcome Nina. Looking forward to your great sketches!!!! Welcome ( a little late)... I was away for a while. It' exciting to have another Silicon Valley-sketcher out there!